Anambra is a state in southeastern Nigeria. Its name is an anglicized version of the original 'Oma Mbala', the native name of the Anambra River. The capital and seat of government is Awka. Onitsha is by far the largest urban area. The state's theme is "Light of the nation". The indigenous ethnic group in Anambra state are the Igbo (98% of population) and a small population of Olumbanasa people (2% of the population) who live mainly in the north-western part of the state. Over the last two decades the rural/urban exodus has caused a shift, making Anambra a highly urbanized state with 62% of its population living in urban areas. In October 2015, the APGA-led state government of Willie Obiano signed memorandum of understanding with Galway modular housing company, Affordable Building Concepts International for 10,000 housing units in the State. Faced with decades of neglect and bad governance, the shift in human migration has posed problems to available infrastructural provision, environmental sanitation, erosion control and other social services. As a result, major cities have become characterized by inadequate and deteriorated road networks, walkways, unregulated building patterns, sanitation, uncontrolled street trading, mountains of garbage, and chaotic transport systems, creating congestion, noise pollution and overcrowding. To address this situation, the government of Peter Obi with the assistance of the UN-HABITAT produced 20-year structural plans (2009–2028) for three major cities in the State, Onitsha, Nnewi and Awka Capital Territory to restore urban planning and guide their growth into the future. The plans contain policies and proposals for land use, city beautification, road infrastructure, industrial development, housing, waste disposal, water supply and health and educational facilities to turn the cities into Anambra into successful urban areas to generate employment, wealth and provide high living standards for its residents. Anambra became the first state in Nigeria to adopt Structural Plans for its cities and with effective implementation should systematically grow as a major economic center in Nigeria and West Africa. The process of urbanization is fairly contributed by population growth, immigration, migration, and infrastructure initiatives like good road, water, power, and gardens, resulting in the growth of villages into towns, town into cities and cities into metros. However, in such a phenomenon for ecological feasible development, planning requires an understanding of the growth dynamics, if not people will continue moving from our villages in search of greener pasture living only the aged men and women to farm, this is noticeable in Amesi, Akpo, and Achina towns in Aguata local government area. They major in the production of yam, Cocoyam and cassava through consistent agriculture. These agricultural activities have in recent time suffered a setback due to massive out-migration of their youths to the urban centres, thereby resulting in food scarcity and over population in urban environment. In furtherance of efforts to upgrade the State capital, Awka, Governor Willie Obiano flagged off the construction of three fly-overs between the Amawbia and Arroma end of the Enugu-Onitsha Expressway, a distance of about three kilometres within Awka city. Agulu Crocodile Lake is located along Awka road in Agulu, Anaocha Local Government Area of the state. A potential tourist site, it is home to an estimated three hundred crocodiles and water turtles. Fishing is not allowed on the lake and the crocodiles, being sacred animals to the people, cannot be killed. Legend says that these crocodiles were instrumental in delivering the town from enemy soldiers during the Nigerian civil war. It is believed that these sacred crocodiles and turtles transformed themselves into beautiful ladies and lured the soldiers unawares into the lake where they disappeared without trace. At noon the crocodiles and the turtles appear at the banks of the lake to take in sunlight. 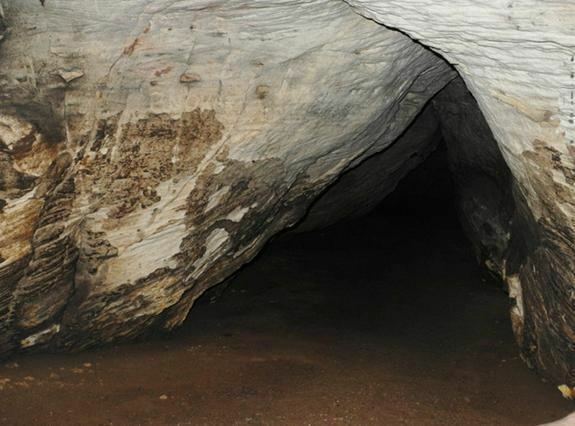 Ogbunike Caves, listed by UNESCO as a world Heritage Site is one of the most visited tourist sites in Anambra State. It is classified as a Sandstone cave (Lateritic sandstones of Campanian-Miocene age). It has very scenic vegetation with attractive waterfall. It is situated in the Ogba hills Ogbunike, across the Ugwu-Aga Escarpment Umunya by the Enugu/Onitsha Expressway and lies in the coordinates of N06 11 11 and E06 54 21. Igbo Ukwu Museum: is an ancient town known for astonishing metalcrafts and has remained an attraction to tourists because of its bronze artifacts. The bronzes which were first noticed in 1938 and later excavated by Thurstan Shaw (an English archaeologist) date back to about the 9th century, are of high value and historic relevance. Imo-Awka Festival of Awka. the biggest tourist show In Anambra Usually commence June–July. Ijele Masquerade- listed in UNESCO Archives as Intangible cultural element Ijele dance festival is home to the 'Olus' of the Omambala area: Anaku, Omor, Nsugbe, Aguleri, Umuleri, Awkuzu, Nteje, Ogbunike, Nkwelle-Ezunaka, Umunya, etc. Abele masquerade of Omambala area: Anaku, Igbakwu, Aguleri, Umuleri, Awkuzu, Umunya, etc. The River Niger at Onitsha and Asaba with the famous Niger bridge is the eastern gateway linking the South East with Niger Delta and Western Nigeria. 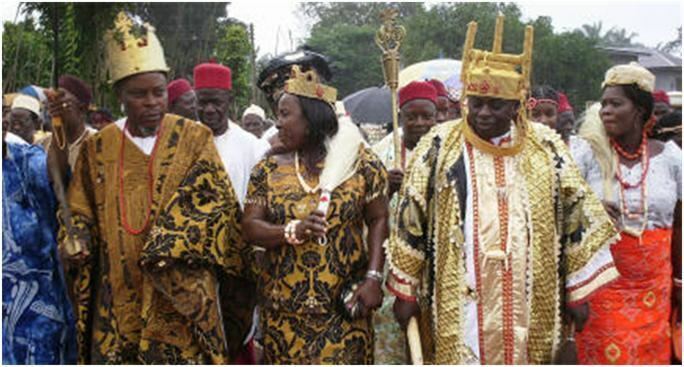 Ofala (Ovala) Festival is the commemorative of Kingship celebrated by various towns. It was popularised by Onitsha town. Uku, an annual masqurade festival in Amanasaa Umuchu, Aguata local government area. Awka, the state capital, is also the center of Nigeria's metalwork and carving industries. Educationally, Anambra is a centre of excellence. 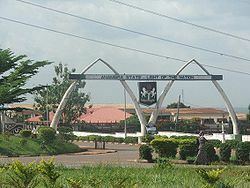 There are the Nnamdi Azikiwe University (UNIZIK), Awka a federal university with College of Medicine situated at Nnewi. The UNIZIK Nnewi runs a modern Teaching Hospital with facilities also at Umunya and Ukpo. UNIZIK also has faculty of pharmaceutical sciences at Agulu, School of Preliminary studies at Mbaukwu and College of Agriculture. The Anambra State University, formerly known as Anambra State University of Science and Technology (ASUTECH), with two campuses, one in Uli, and another at Igbariam; the Federal Polytechnic, Oko; Nwafor Orizu University of Education (formerly known as the Nwafor Orizu College of Education), Nsugbe. Private Universities include The Tansian University, Umunya,Madonna University, Okija, St Paul's University, Awka. Literacy rate in the state is comparatively high compared to other states. Primary and secondary school enrollment in the state is one of the highest in the country. Consequently, Anambra state has the highest number of JAMB candidates going after the limited number of spaces in Nigeria's tertiary colleges, and since 2011/2012 till date (2014) has made the best results in both WAEC and NECO conducted senior secondary school examinations. Anambra’s political history can be described as varied and up until recent history, troubled. It is a state with a long list of "firsts" in Nigeria history that dubbed the sobriquet "The Light of The Nation". On May 29, 1999, Chinwoke Mbadinuju was sworn in as civilian governor of Anambra state, after many years of military rule. His administration was marred by heavy problems. The most notable is the teachers' salary which was withheld for a long time. This led to a ten-months strike in all the government secondary schools in the state. Also, before his rule, secondary education had been free of charge. But his administration prescribed a tuition fee of 3,000 Naira per term for all secondary schools, which led to an unprecedented massive demonstration by the secondary school students from all over the state. Many people attribute Mbadinuju's failure to political godfathers a debacle that also trailed his successor. On May 26, 2003, Chris Ngige was sworn in as the new governor of the state, but he was removed in March 2006 when Peter Obi of APGA dragged him to court on charges of electoral malpractice. The Court of Appeal in Enugu asserted that his election victory in 2003 was fraudulent and ordered him to leave the seat. Peter Obi was in turn ousted by a faction of the Anambra State House of Assembly on November 2, 2006 and replaced by Virginia Etiaba, his deputy. On February 9, 2007 Mrs. Etiaba handed power back to Obi after the Court of Appeal had nullified Obi's removal. On April 14, 2007, Andy Uba of PDP was "elected" the new governor of the state and, on May 29, was sworn in as the new governor. The election was reported to be massively rigged and was disapproved all over the country. On June 14, 2007 the Supreme Court of Nigeria removed Andy Uba from office and replaced him with his predecessor Peter Obi, on the ground that Peter Obi's tenure had not ended, therefore there was no vacancy in the governorship. On Saturday, 6 February 2010, Peter Obi was re-elected governor for a second term of four years, after a hot contest with Chris Ngige, a former governor of the state; Prof. Charles Soludo, a former governor of the Central Bank of Nigeria and Andy Uba who was a strong voice in the state's politics. Other contenders included Mrs Uche Ekwunife, Prince Nicholas Ukachukwu and many others. Altogether, there were twenty-five contestants for the office. Peter Obi was named the winner of the election, with more than 30% votes above the immediate runner-up. Presently, chief Willie Obiano was sworn in on the 17th of March, 2014 as the new governor after the expiration of the Peter Obi second term, having won the November 16th, 2013 election. With an annual population growth rate of 2.21 percent per annum, Anambra State has over 60% of its people living in urban areas making it one of the most urbanized places in Nigeria. The major urban centres of Anambra state are Onitsha including Okpoko, Nnewi, and Awka. Awka and Onitsha developed as pre-colonial urban centres with Awka as the craft industrial centre of the Nri hegemony; and Onitsha the city state on the Niger and a river port and commercial centre. Onitsha is a fast-growing commercial city, and has developed to become a huge conurbation extending to Idemili, Oyi and Anambra East LGAs with one of the largest markets in West Africa. Nnewi (the Taiwan of Nigeria) is a rapidly developing industrial and commercial centre; and Awka, by becoming the state capital is, as it were, regaining its precolonial administrative eminence. Other main towns of Anambra state are: Abagana, Abba, Abacha, Abatete, Achalla, Achina, Adazi Ani, Adazi-Enu, Adazi-Nnukwu, Agukwu, Aguleri, Agulu, Aguluezechukwu, Aguluzigbo, Ajalli, Akpo, Akpu, Akwaeze, Akwaukwu, Alor, Amaetiti, Amansea, Amanuke, Amaokpala, Amawbia, Amesi, Amichi, Amorka, Anaku, Atani, Awa, Awba-Ofemili, Awgbu, Awka-Etiti, Awkuzu, Azia, Azigbo, Ebenator, Ebenebe, Ekwulobia, Ekwulumili, Enugwu-Agidi, Enugwu Aguleri, Enugwu Ukwu, Ezinifite, Ezinihite, Eziowelle, Ezira, Ichi, Ichida, Ideani, Ifitedunu, Ifite-Ogwari, Igbakwu, Igbariam, Igbedor, Igbo-Ukwu, Ihembosi, Ihiala, Ikenga, Inoma, Iseke, Isuaniocha, Isulo, Isuofia, Lilu, Mbosi, Mgbakwu, Mmiata Anam, Nando, Nanka, Nawfia, Nawfija, Nawgu, Ndikelionwu, Ndi-okpaleke, Ndiukwuenu, Nibo, Nimo, Nise, Nkpologwu, Nkpor, Nkwelle-Ezunaka, Nneni, Nnobi, Nnokwa, Nnokwa, Nsugbe, Nteje, Nzam, Oba, Obeledu, Obosi, Ogbunike, Ogbunka, Ogidi, Ojoto, Okija, Oko, Okpeze, Omasi, Omogho, Omor, Ora-Eri, Oraifite, Oraukwu, Orsumoghu, Osumenyi, Owellezukala, Owelle-Olumbanasa, Ozubulu, Ubuluisiuzor, Ufuma, Uga, Ugbenne, Ugbenu, Uke, Ukpo, Ukpor, Ukwalla-Olumbanasa, Ukwulu, Uli, Umuanaga, Umuawulu, Umuchu, Umudioka, Umueje, Umuerum, Umueze Anam, Umuoba Anam, Umuleri, Umumbo, Umunachi, Umunya, Umunze, Umuoji, Umuomaku,Umuona Unubi, Utuh et al. Anambra possesses a history that stretches back to the 9th century AD, as revealed by archaeological excavations at Igbo-Ukwu and Ezira; Great works of art in iron, bronze, copper, and pottery works belonging to the ancient Kingdom of Nri, revealed a sophisticated divine Kingship administrative system which held sway in the area of Anambra from c. 948 AD to 1911. During the Nigerian/Biafran war, a relief airstrip, was constructed by Biafran engineers in the town of Uli/Amorka (code named "Annabelle"). Extremely dangerous relief flights took off from Sao Tome and other sites loaded with tons of food and medicine for the distressed Biafran population. Uli/Amorka airstrip was the site where brave American pilots like Alex Nicoll, and scores of others, made the supreme sacrifice in the service of humanity, delivering tons of relief supplies to the Biafran population. Disgusted by the suffering and mounting death toll in Biafra from starvation as well as the continuous harassment of the relief planes by the Nigerian Airforce, Carl Gustaf von Rosen resigned as a Red Cross relief pilot and helped Biafra to form an Airforce of five Minicoin planes Malmö MFI-9 stationed at the Uga airstrip. He named his tiny but effective airforce "Babies of Biafra" in honour of the babies who died via starvation inside Biafra. 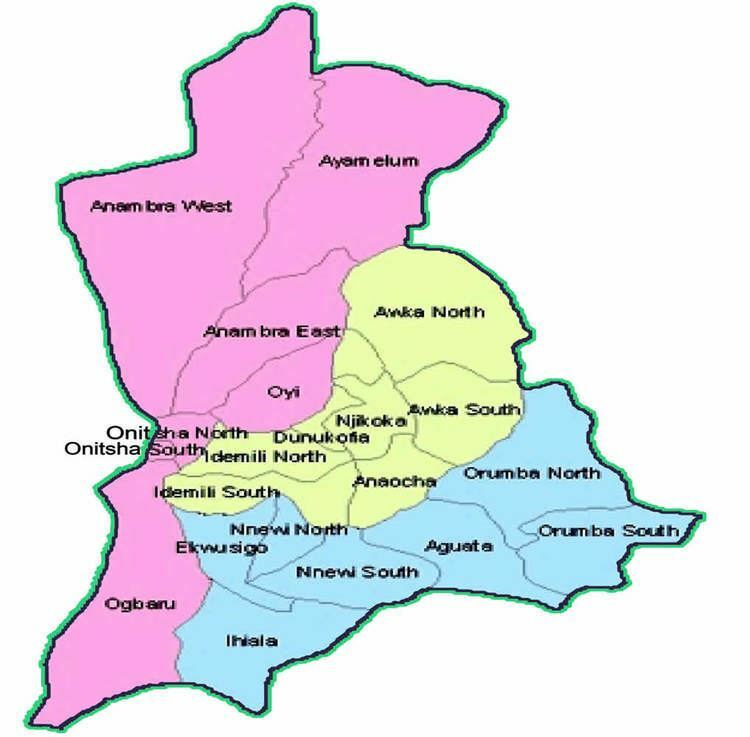 Old Anambra State was created in 1976 from part of East Central State, and its capital was Enugu. A further re-organisation in 1991 divided Anambra into two states, Anambra and Enugu. The capital of Anambra is Awka. Engineer Mark Ezemba from Amorka Ihiala Local Government Area.